Marathon training is a lot like conducting an orchestra. A lot is happening all at the same time and you are in charge of managing it. Focus on the things you can control and let go of the things you can’t. When you sit in fear, review your log and have faith in preparation. You’re already doing the hard part (training), the race is the celebration. We took a red eye out of LA Thursday night and landed in Boston Friday 5AM. Not the best idea, but it was cheap and we had time over the weekend to recover and rest. 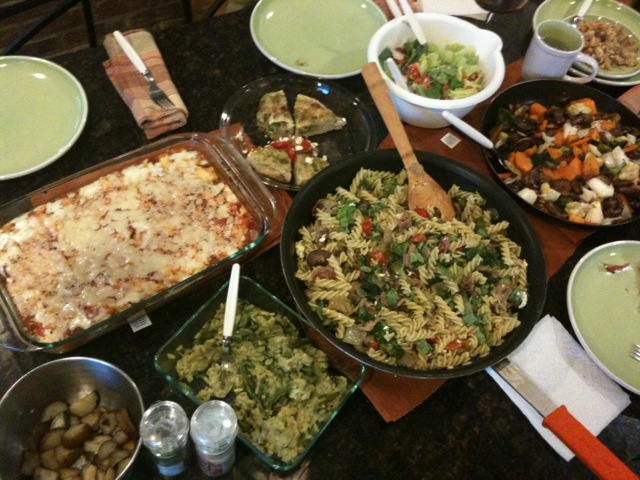 We had a awesome house set up in Boston, a couple miles away from the Finish and ended up cooking and eating the entire weekend. 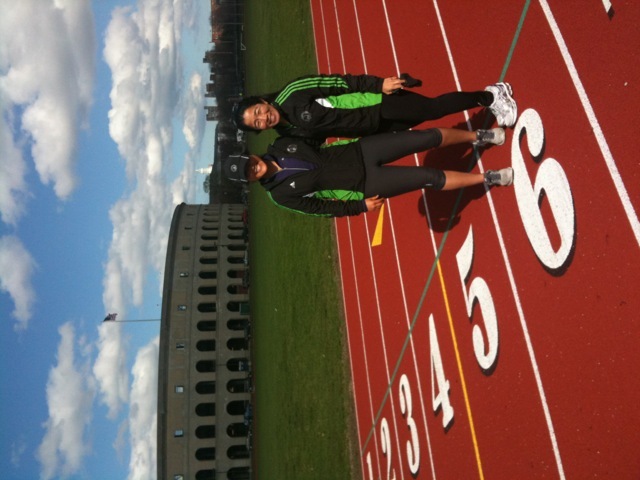 I took my runs easy in Boston, did a 6 mile jog along the Charles River and did strides on the Harvard track. It is so tempting to jump on the track and do a couple laps when it is a block from your house! The race didn’t actually start until 10AM, 10:20AM for me since I was in Wave 2, but we still had to be on the bus to the start at 6:30AM. We took a bus from our house to the train station before getting in line for the bus. The lines were pretty ridiculous, everyone was crowding and trying to get on a bus, or maybe it was just our line. We got lucky and all of us managed to get on the same bus even bumping into some friends. The drive to the start in Hopkington was really really long. I mean, it’s at least 26.2 miles, but it took us almost an hour to get there. We entered Athlete’s Village and just chilled for a little before having to drop our sweat bags off and head to the start line which was 0.7 miles away. I guess I thought I had a lot of time during this downtime, but I ended up having to jog the 0.7 miles to the start and only had a minute in the corral before our wave took off! The first 3 miles were pretty much downhill. I had heard numerous times throughout the weekend to not go out too fast because you will arrive to mile 20 with burned out quads. I think my first few mile splits were around 8 min/mile. I “think” because my stupid Garmin died again! Only after 2 hours so I don’t have all my splits. Honestly I was feeling pretty crappy the first 5 miles. Cursing at myself for even running the past 2 days and doing sprints on the track! What was I thinking?? But this happens at every race I do. I spend the first 5-6 miles in total misery and agony and hating myself because my body is so tight and won’t warm-up. Once my body starts to loosen up, then the real race starts for me. Unfortunately, it takes such a long time for me to warm-up and by the time I was starting to have fun, it was already the 10K mark. We went through neighborhoods and the scenery reminded me of something out of Blair Witch project with all the trees in the forest. Around the halfway point, we headed towards Wellesley college. I had heard stories that you could hear the girls from a mile away and when you ran past them it was like a roar of thunder. I heard some faint cheering from a mile away and when we got to the girls, I was a little disappointed by the amount of girls that showed up. Maybe they hadn’t all come out yet? But there wasn’t as many Wellesley girls as there were kids from Boston College. All the girls had signs like “Kiss me. I’m ____”. Saw a couple sweaty guys go up to the girls and hug/kiss them. Ew. It was still pretty cool to run by the school and through their little town. From the halfway point, I just kept thinking about getting to Mile 16 because I knew that’s when the rolling hills would come in all the way to Mile 20 (Heartbreak hill). There were a couple rollers, but nothing too serious that you had to stop and walk, but I could tell the hills were getting to a lot of people as many people around me started to walk. I took some walking breaks through the aid stations and slowed down my pace up the hills. 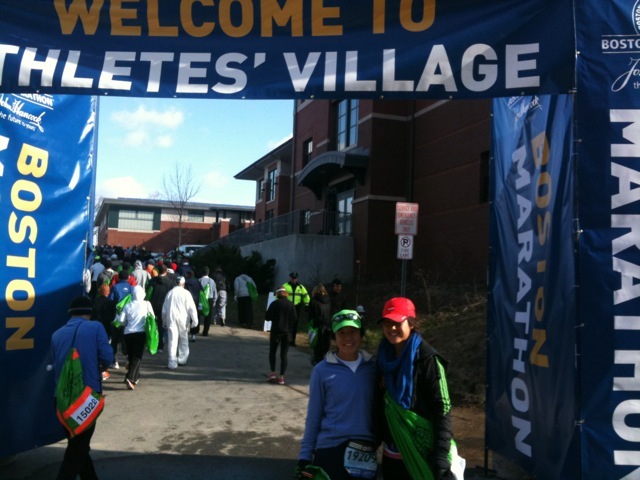 I was bracing myself for the infamous Heartbreak hill that was to arrive after the 20 mile mark. Honestly, I had no idea I was even on Heartbreak hill until I reached the top and saw a sign that said “Congrats for conquering Heartbreak hill!”. What?! I just missed the whole thing! I feel like that hill is wayyy too overhyped. Maybe it’s from all the trails, but the “hill” was less than a mile long and it would go up, plateau, then go up again and plateau. Sure, it wasn’t the easiest of rides, but it was definitely doable. Around that point we were in Boston College and literally, ALL the kids came out. Wow, it was amazing to see all the cheering students. We ran by a couple frat houses and people were grilling out since it was lunchtime and drinking beers. So much fun. That was probably one of the highlights of the race. With only 6 miles to go, I knew this is where the real marathon begins. Legs were tired but I still felt like the miles were flying by. I knew once I saw the CITGO sign at Mile 25, we were almost home. Apparently we ran past Fenway park where a Red Sox game was just getting out, but I missed that part and didn’t see any Red Sox fans. The last mile stretch was all about taking in this amazing experience and thinking about the journey to get to this place. It was kind of unreal the amount of people that surrounded that last mile. People on top of bridges, on the other side of the street trying to be a part of this race. I crossed the finish line at 3:59:45. Talk about cutting it close! Took a while to make it out of the finishing corral with all the runners and met up with a few friends at our designated meeting spot. Jumped on a plane 2 hours later and took a 6 hour flight back home to LA that night. Note to self: never do that again. Since the race was so late, I was worried about eating too much or not enough. I managed to eat a full breakfast around 5AM before we left and then ate some PB toast 1.5 hours before the race. This seemed to work well and never had to take a single GU during the race! I don’t know what it is, but my body doesn’t like to take all those gus and chomps. I guess ever since I started trail running, I would rather get my calories from real food (i.e. bananas, oranges). My nutrition intake throughout the race was water+Gatorade every 2 miles, half a banana and a couple orange slices. Never bonked once! I had a blast on the course and I have to say, this is my 2nd favorite marathon behind Walt Disney. Even though my time wasn’t fast at all, I loved all the support and crowd along the course. I never saw an empty space on the sidewalk the entire time I was running. I don’t have a qualifying race for 2012, so I’m going to do American River 50 in April and Eugene Marathon in May. Hopefully I can work on my time and get it down to a 3:30 or 3:35 to qualify for Boston in 2013. I personally thought the course was super super fast, especially with that tailwind behind us. The course has rollers, but there was also a lot of downhills. I also thought the miles went by really fast, even though I was out there for almost 4 hours. I think all the trail running has really warped my time judgement. I’m used to being out there for 6-8 hours for a long run and 26 miles would have taken me so much longer on trails. I guess this is a good thing, but I am definitely losing speed. Hoping to get back to track after school is over and get back to where I used to be and still have the endurance for ultras. I have Big Sur marathon next weekend, which is a total recovery/fun run seeing how the course is pretty challenging. Hoping to run it with a friend and just enjoy the views and being in Big Sur. It will also be my last marathon for the year! I can’t believe it, but it’s time to hit the dirt and spend most of my time there. I enjoy road races, but I missed the low-key feel of trail races. I miss just hanging out at the aid stations talking to volunteers and other runners and eating some really great food. I think marathons are a little too much for me with all the people running right up next to me. This girl needs some nature, single track trails and mud. I’m going to take what you said about training for a marathon & apply it to my skating. The performance is the celebration. I like that. You’ve come a long way, you look very proud. 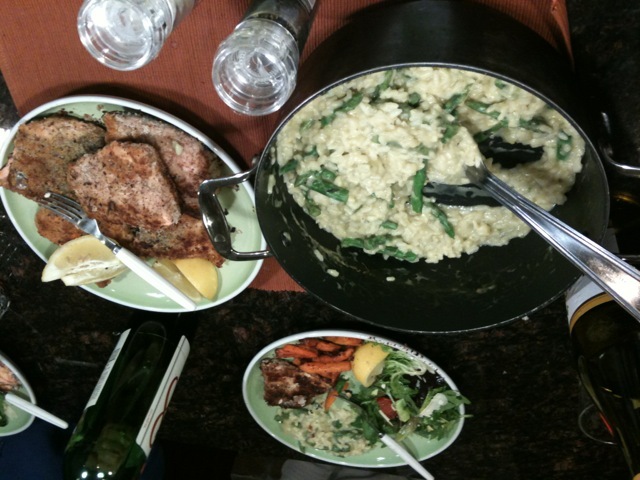 Awesome that you guys had a house & were able to cook your own stuff as well. 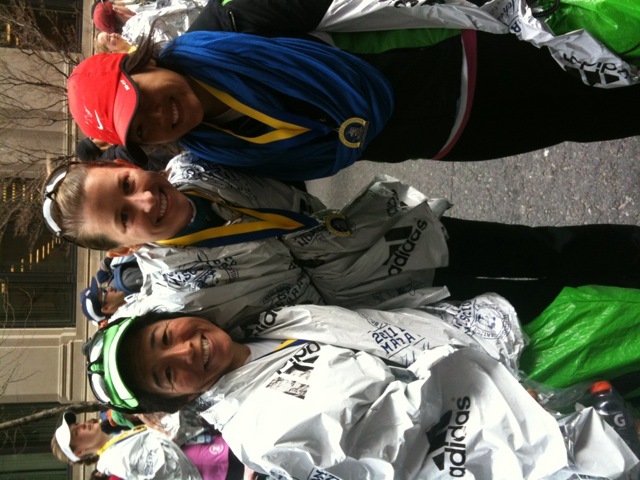 Congratulations on your Boston race!! I really enjoyed reading your race recap. You hit lots of important things and still kept it honest!